Chimps, Humans and Monkeys: What's the Difference? You are at:Home»Conservation»Chimps, Humans, and Monkeys: What’s the Difference? 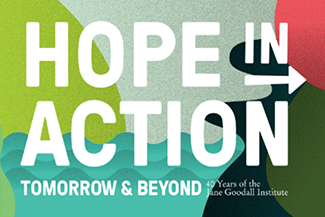 It’s finally time to set the record straight: As much as we all love monkeys, Dr. Goodall’s studies and the work of the Jane Goodall Institute have primarily focused on chimpanzees, not monkeys. Now, I know your next question is probably, “But aren’t chimps the same thing as monkeys?” and the answer is, they are not! So what’s the difference and why does it matter? Monkeys, chimpanzees, and humans are primates. Primates are mammals that are characterized by their advanced cognitive development and abilities, grasping hands and feet, and forward-facing eyes, along with other characteristics. 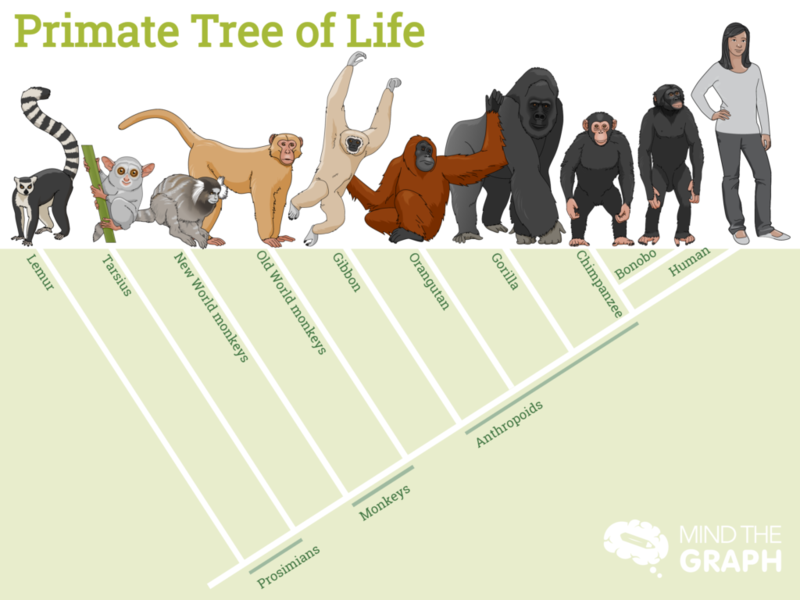 Some primates (including some great apes and baboons) are typically terrestrial (move on the ground) versus arboreal (living in the trees), but all species of primates have adaptations to climb trees (EOL). Millions of years ago, primate ancestors evolved different defining characteristics from one another, branching into many species within different groups. Ok, so we understand how to identify great apes, but what about monkeys? There are many different species of monkeys, and what are known as ‘lesser apes’. Lesser apes (gibbons and siamangs) are usually smaller in stature, with thin arms, and a slightly smaller brain. Finally, monkeys are divided into “New World” and “Old World” monkeys. Many Old and New World Monkeys have tails, tend to walk on all fours like a cat or dog, and have the smallest brain out of the groups. Some Old World monkeys include baboons and guenons, while some New World monkeys include Capuchin and spider monkeys! Now let’s get back to chimpanzees and humans. Humans did not evolve from chimps, as is a frequent misconception. Chimpanzees and humans share a recent common ancestor, and as some of this ancestral population evolved along one line to become modern chimpanzees, others of this ancestor evolved along a line of various species of early human, eventually resulting in Homo sapiens (you and me!). Chimpanzees are genetically closest to humans, and in fact, chimpanzees share about 98.6% of our DNA. We share more of our DNA with chimpanzees than with monkeys or other groups, or even with other great apes! We also both play, have complex emotions and intelligence, and a very similar physical makeup. 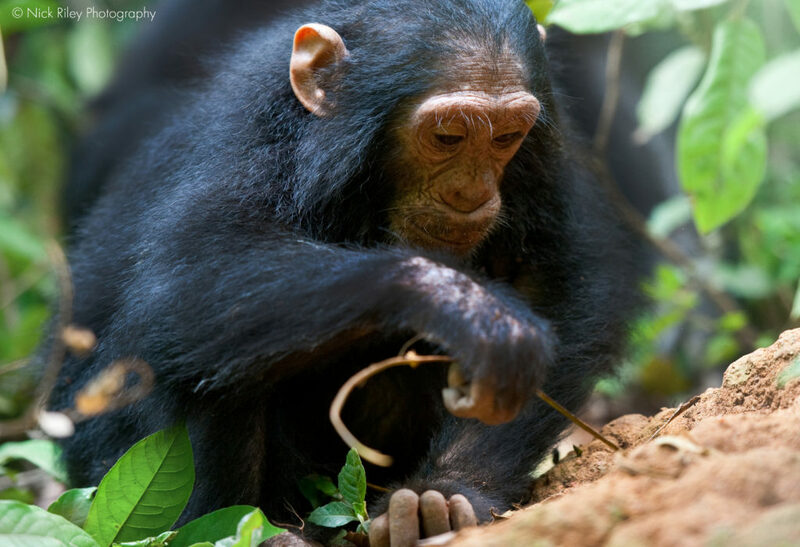 In her research, Dr. Goodall made a revolutionary discovery when she observed that the chimps in Gombe were making and using tools. It was groundbreaking because it meant redefining everything that scientists thought they knew about what separated humans and chimpanzees! Furthermore, this redefined the notion that humans lived “outside” of the animal kingdom, and instead placed humans alongside the rest of animalkind. It has also lead to the revelation that other animals also make and use tools, have emotions, intelligence and sentience. Celebrate the FIRST EVER World Chimpanzee Day this July 14th! Find out more and get involved here. Great stuff. Thanks a lot for the detailed explanation in this article.